Soon after Christmas, I upgraded from a Blackberry Curve to an iPhone 4s. That’s a big upgrade–and I am so happy. I can’t afford the iPhone 5, however nice it might be; besides, compared to a Blackberry Curve, this is new fangled, high-tech stuff. Since I have been using a school issued iPad and MacBook Air, the transition was a piece of cake, and I already had a full arsenal of apps in my iCloud. What I didn’t have was a case. After doing a Facebook survey regarding insurance, most of the response said skip it, but get a good case. A friend said I could try an Otterbox Defender before I bought, but before she could get that to me, I needed something quick to keep the phone from getting scratched in my purse. What to do in such a predicament? Knit one, of course. So I did…on the drive to and from Costco (about 30 minutes). And while it is a little crooked, the bulky yarn does a good job protecting it. I feel a bit silly even providing a pattern for this…if I could make it up, so could any novice knitter, I think. I have since purchased my own Otterbox Defender. I love everything about the case but the air bubbles between the screens. I’ve googled solutions without success. I may actually cut the protector screen off and use another film protector…or just go back to my knit cozy. 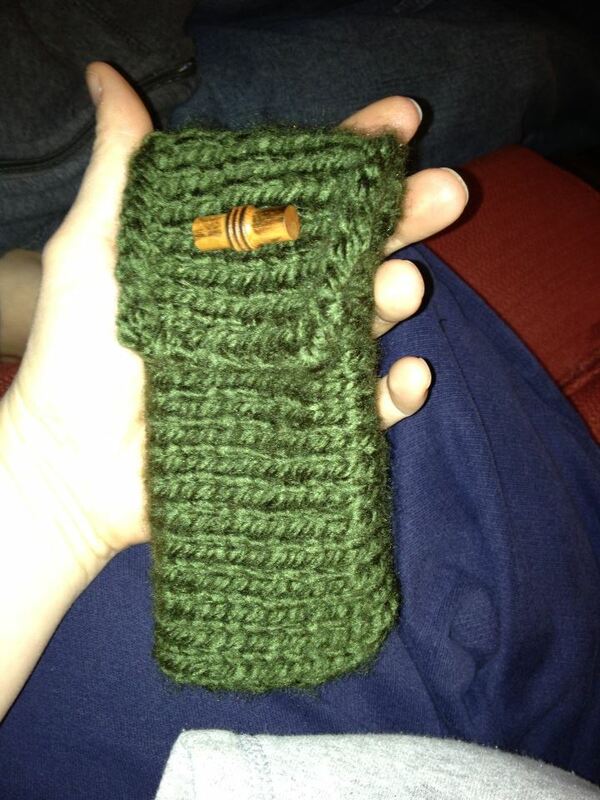 This entry was posted in Knitting Obsessed and tagged Blackberry Curve, iPhone 4s, knitting pattern, Otterbox Defender, phone case. Bookmark the permalink. ← It’s the Time of the Season…to Start Planning my Garden! I feel the same way about things made out of wood. I tend to have an over-inflated view of my abilities, but it always seems easy…… except for that need for precise measurement. I don’t think it is about ability as much as time…the time to measure correctly?